Combining the construction principles of the air screw of a plane and the torsion bar suspension of a Porsche 911, I developed this breakthrough design as a new way to keep a straight string path, an optimized string angle, and a controlled deflection under tension. The lines of the neck are extended beyond the nut, creating an elegant, sleek and streamlined appearance. 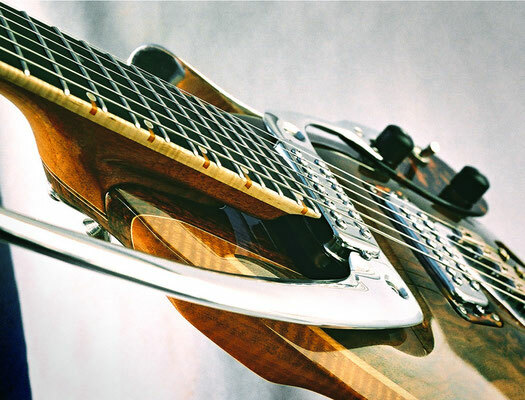 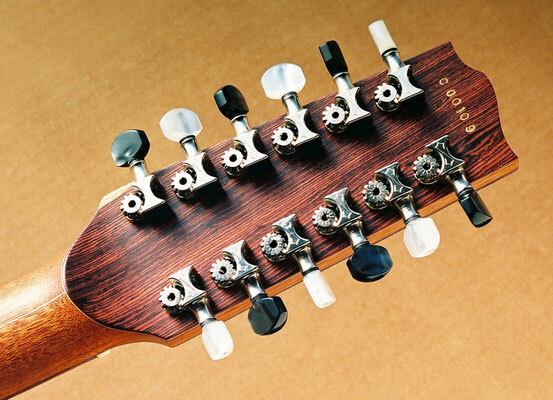 There have been countless variations on the design of guitar and bass headstocks, each with its own advantages and drawbacks. 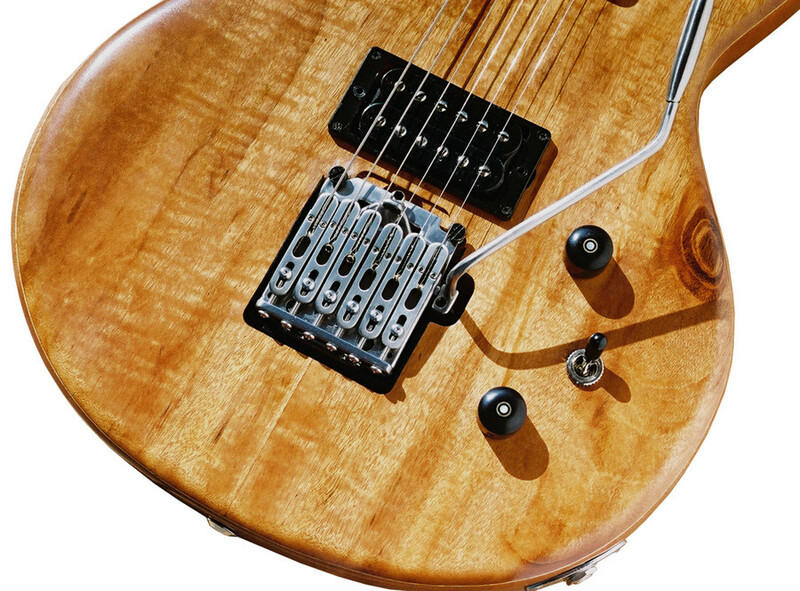 With the TTHSTK I offer a new solution, improving the functionality and performance of string resonance beyond the nut, string tension and tuning stability - a unique, visually distinct design - a perfect example of function flowing into form. 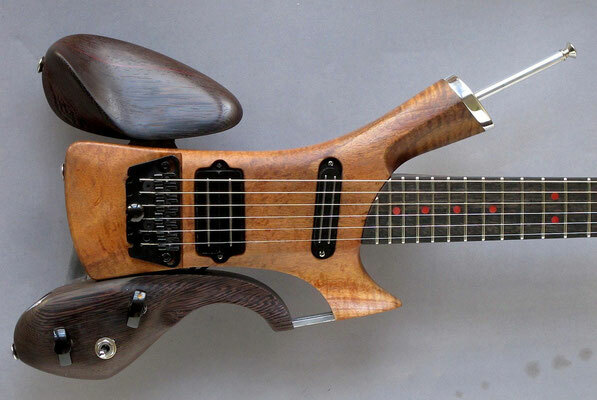 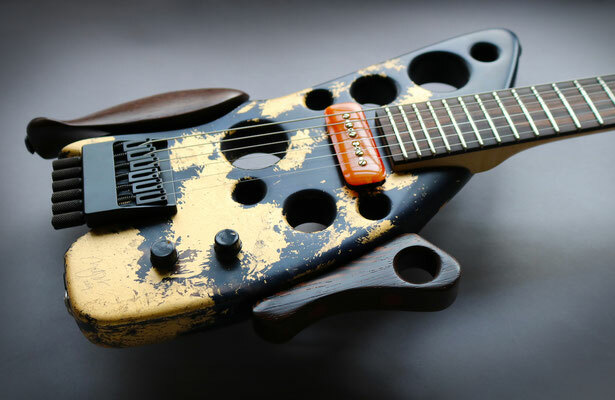 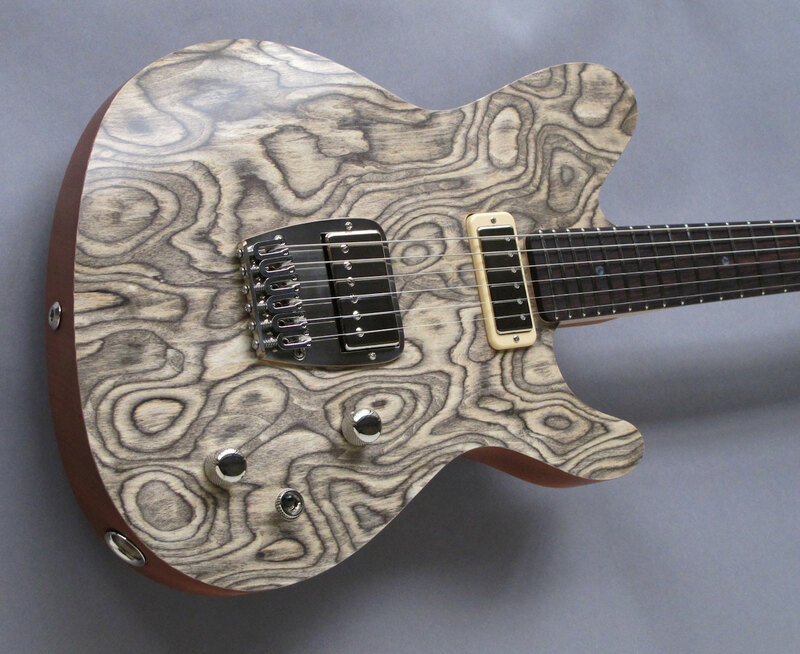 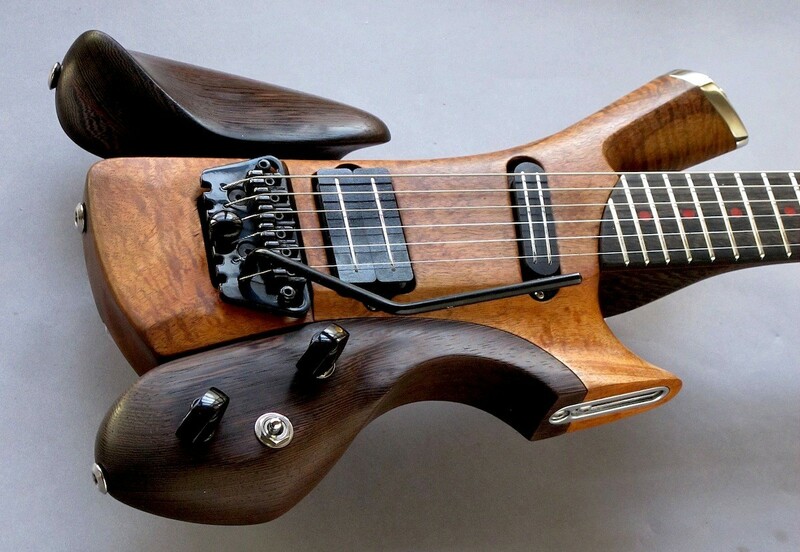 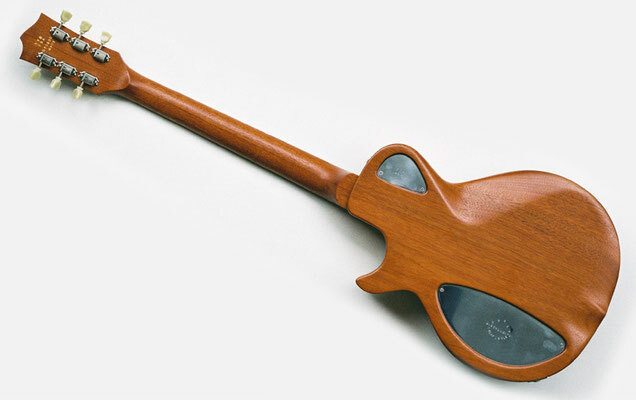 The 'Twist' features a Wenge neck, 25 1/2" scale, mounted into a flame Koa body. Ebony fingerboard w/ red bone markers and nut. The armrest and electronics pod are adjustable to allow the player to optimize the playing position. 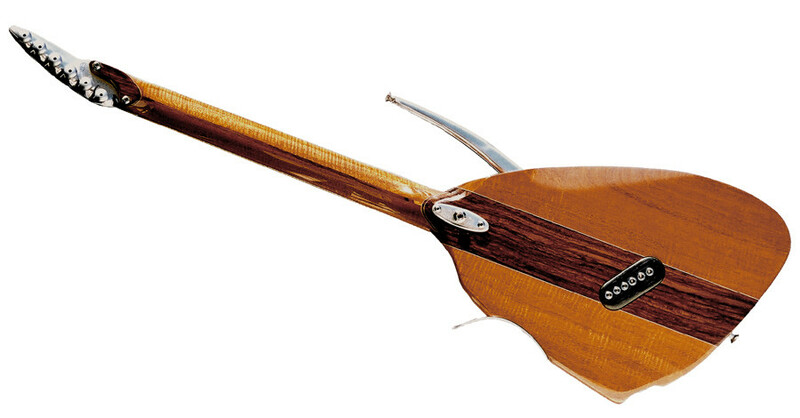 An extendable strap rod ensures perfect balance when using a strap. 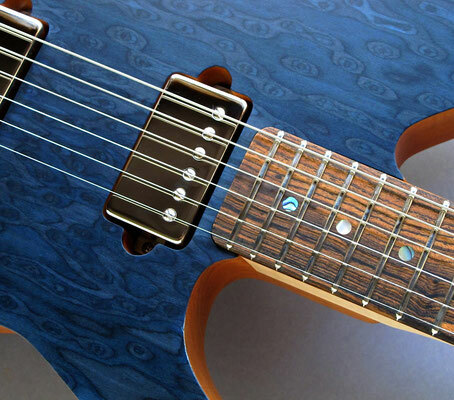 Strategically carved hollows in back relieve the weight of the body while retaining stability and ergonomic comfort. The tone opens up and rings fully, with a nice chime. 2-way truss rod, bone nut 1 5/8"
Eventually changed the bridge and the pickups for a better tone balance - Lindy Fralin Stock tele combination, and solid brass bridge. The 624 line was inspired by 'Ruby 624'. 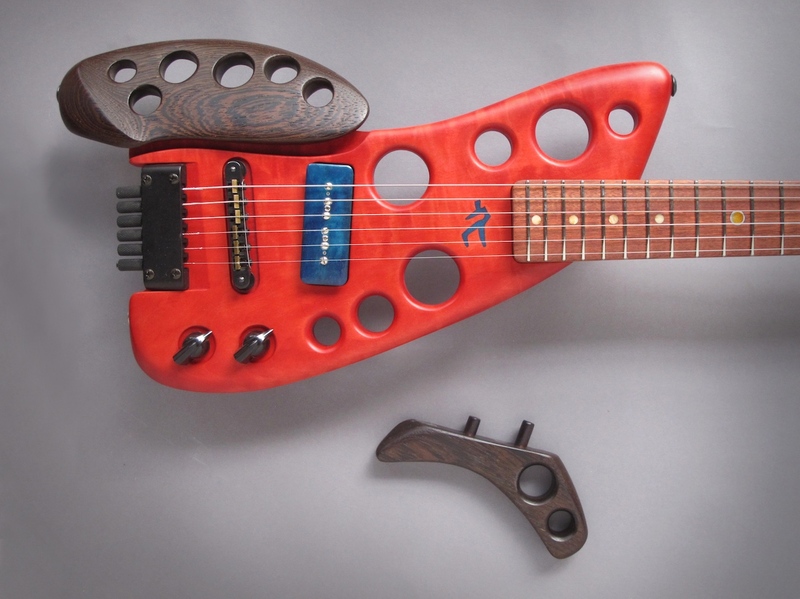 I made a custom mold for the aluminum element and had it cast. 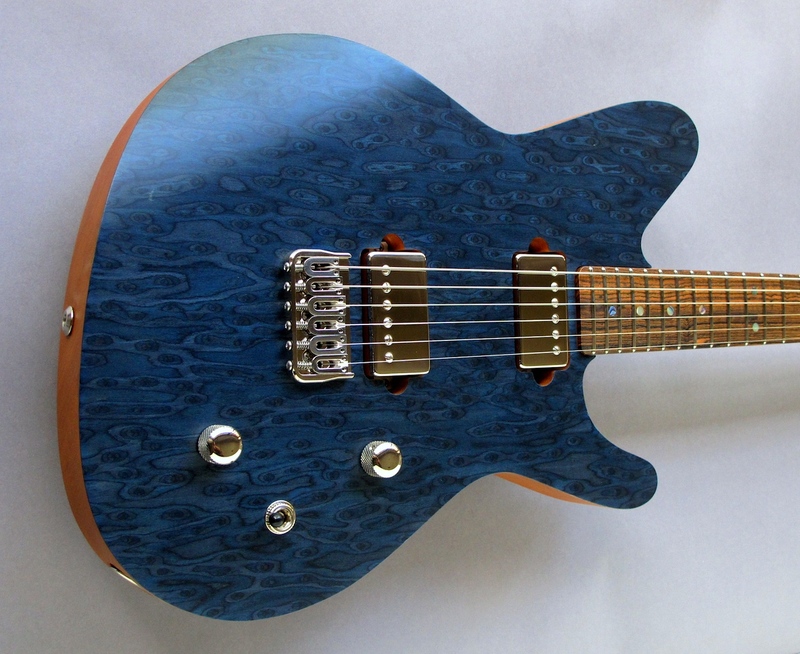 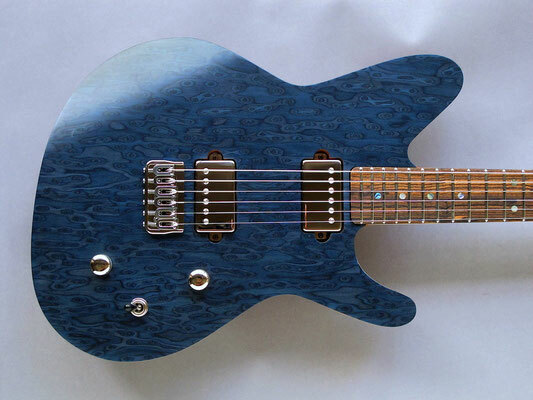 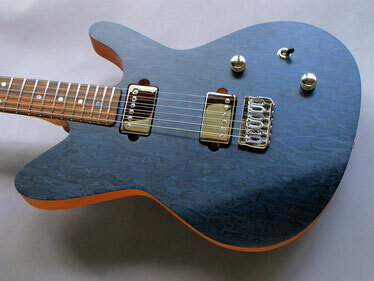 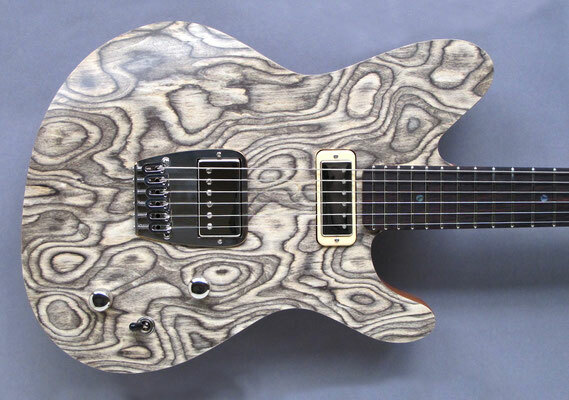 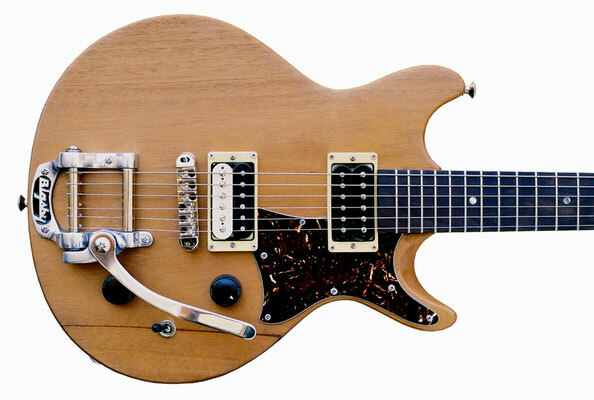 The guitars have a chambered Mahogany body with a deep tenon set neck. 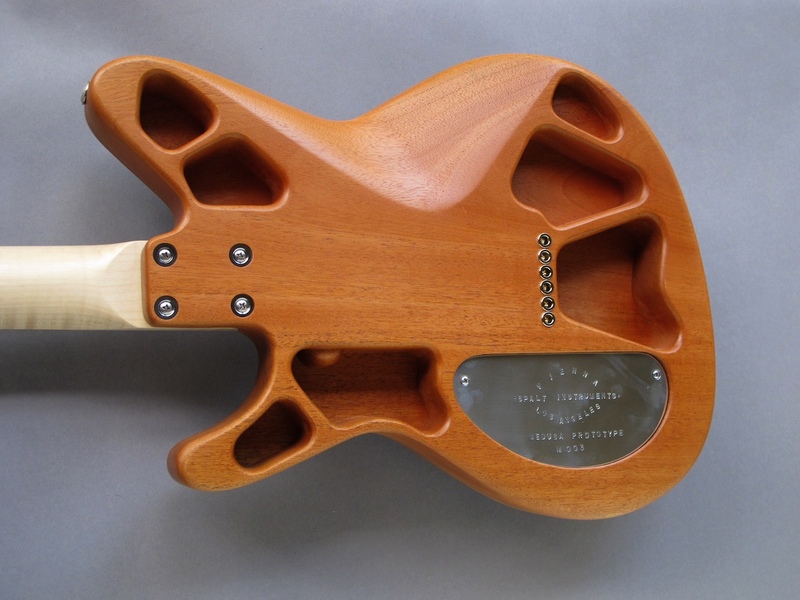 The slightly offset shape is designed to look best slung low, as stage guitar. 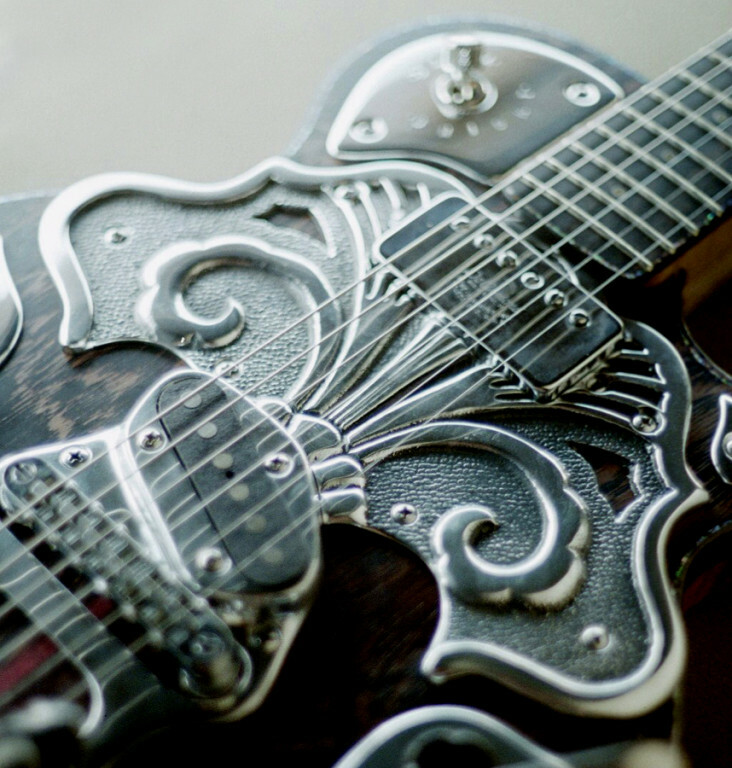 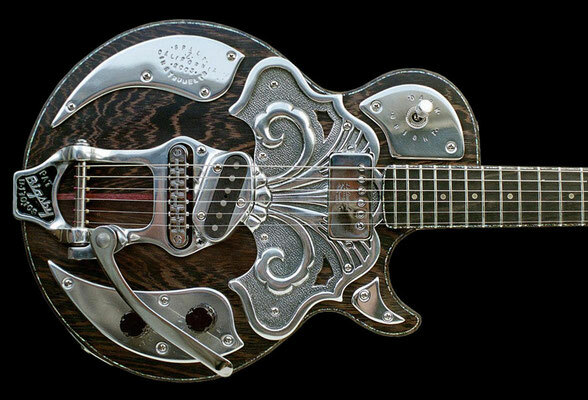 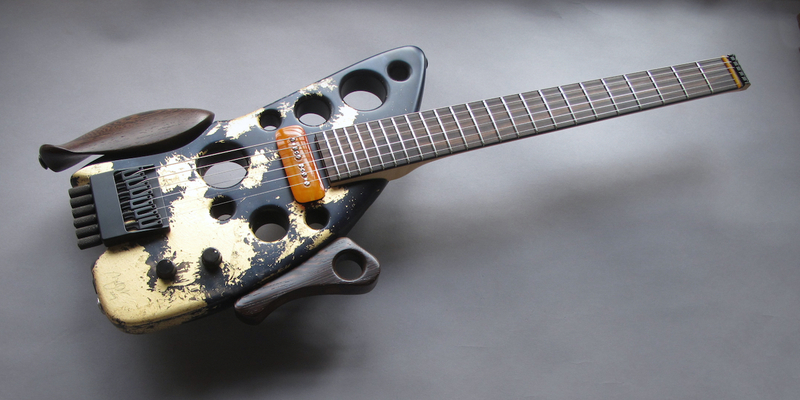 I had this old aluminum decorative piece for a while until I decided to fashion a guitar around it. The reissue of the Bigsby B-16 tremolo gave me the opening I was looking for. 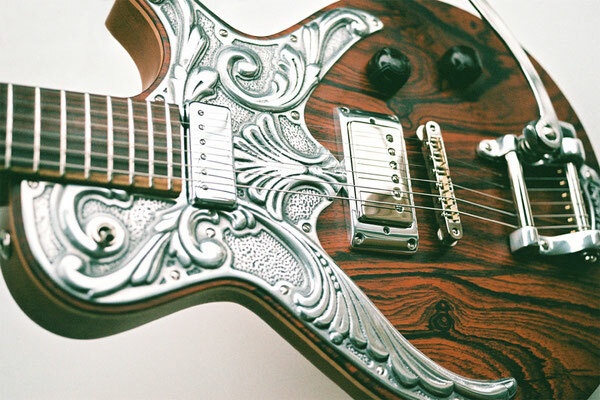 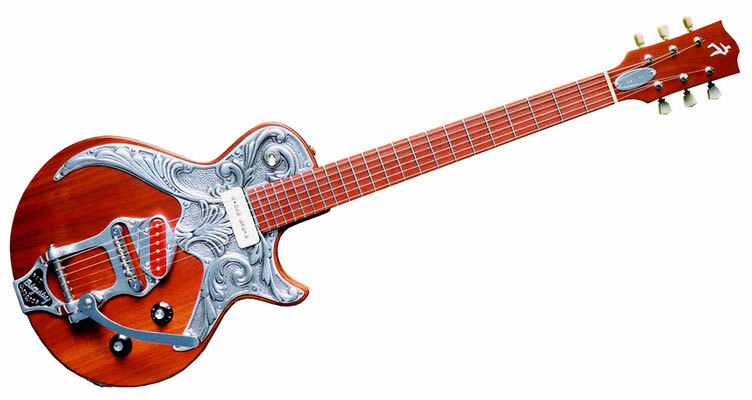 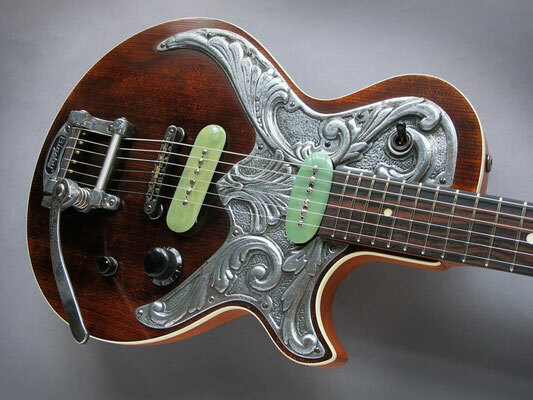 The piece (stamped 'Ruby 624' in the back) became the centerpiece and was fitted with a vintage DeArmond humbucker. 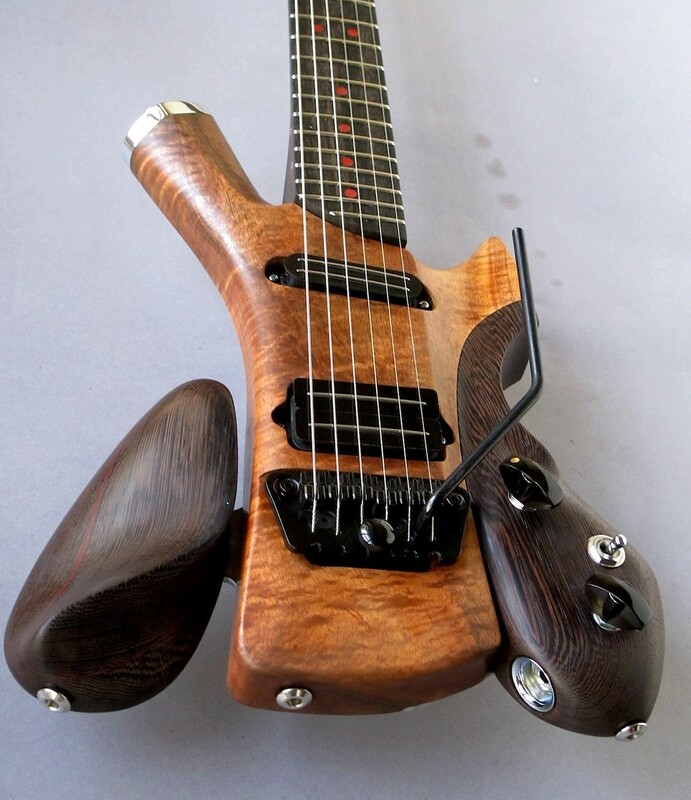 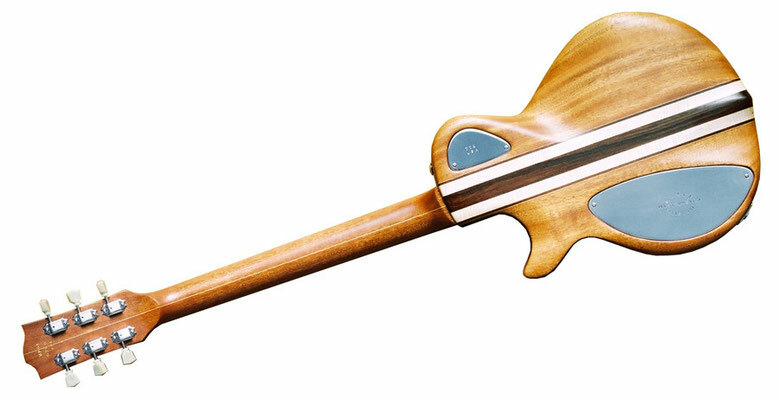 The body top is Wenge, with a Purpleheart centerstripe and Abalone purfling which also extends along the sides of the fingerboard. The top, fingerboard and headstock overlay are made from Bloodwood - an appropriate name for the rich red color of this wood. 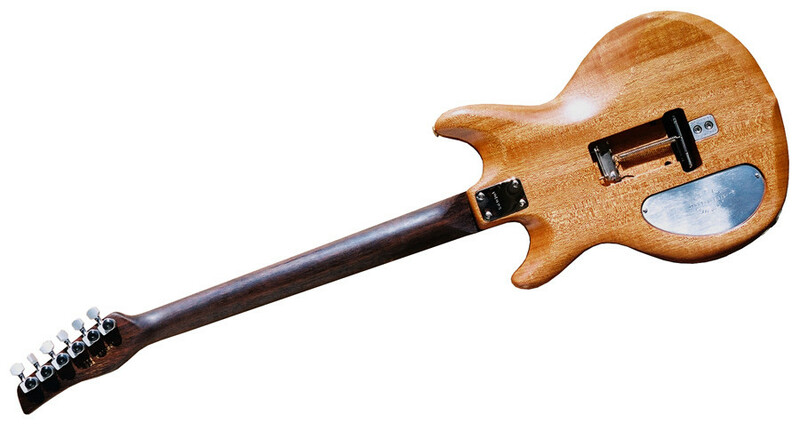 The back is old-stock Mahogany with a centerstripe of laminated flame Maple and Rosewoood. 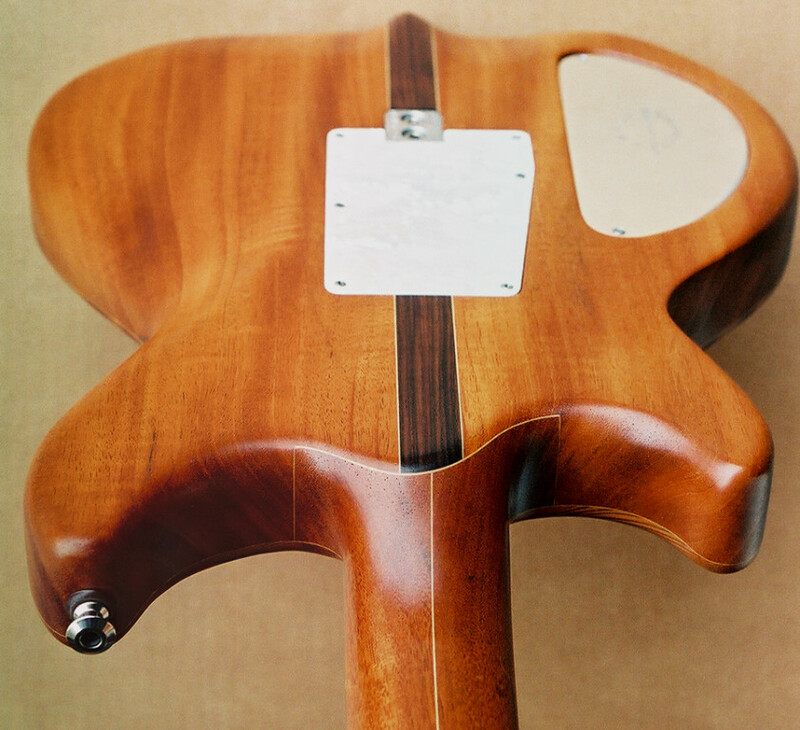 The neck is Mahogany. 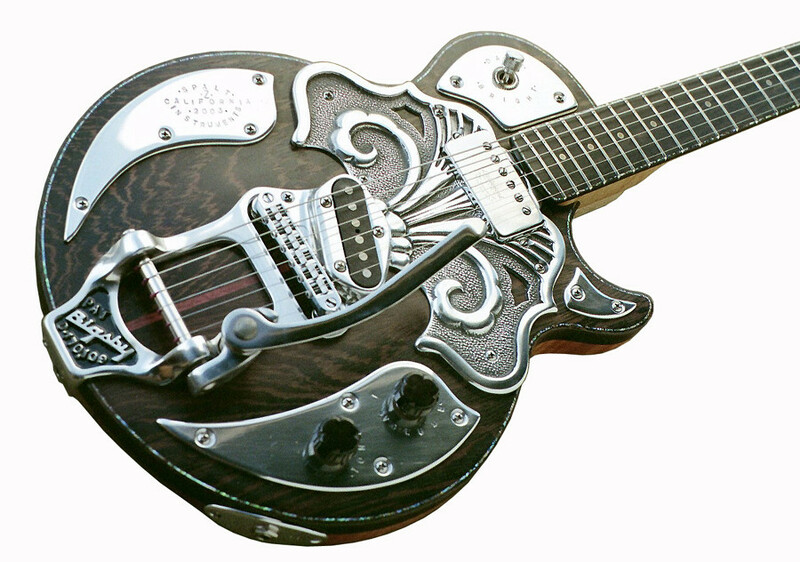 A Bigsby B-16 and two 'BoneTop' pickups along with Gotoh vintage style locking tuners are fitted. 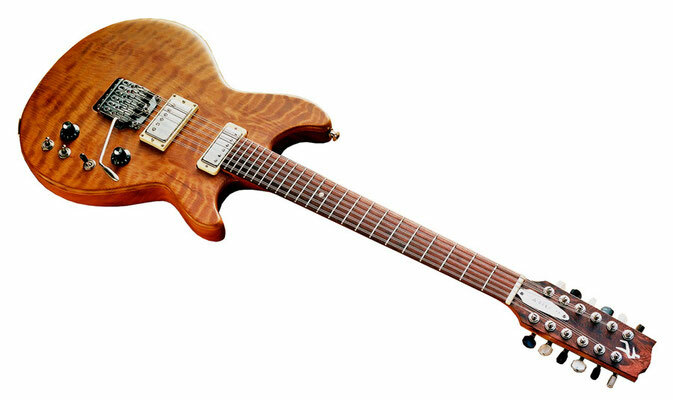 A Cocobolo top and fingerboard grace this 624. 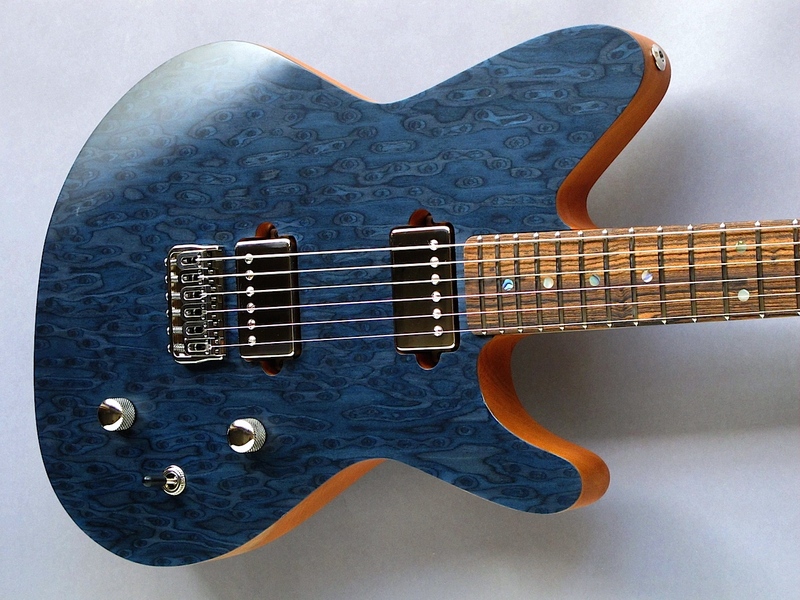 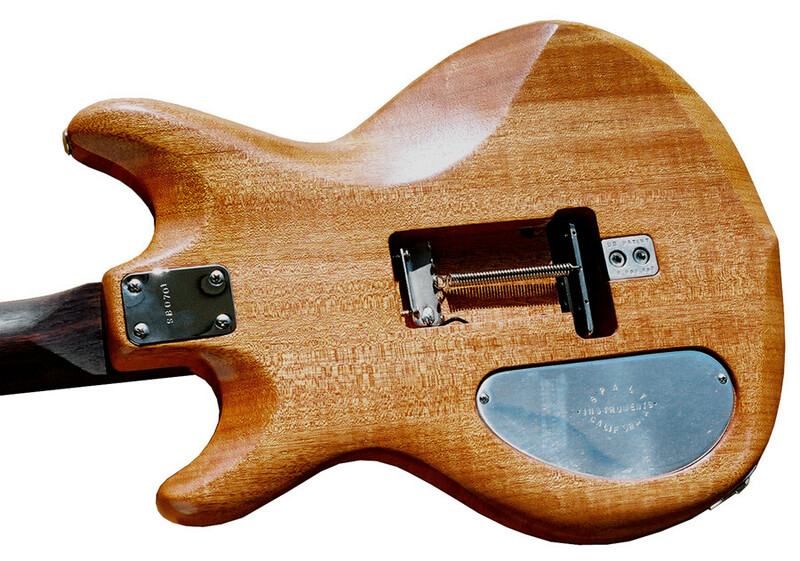 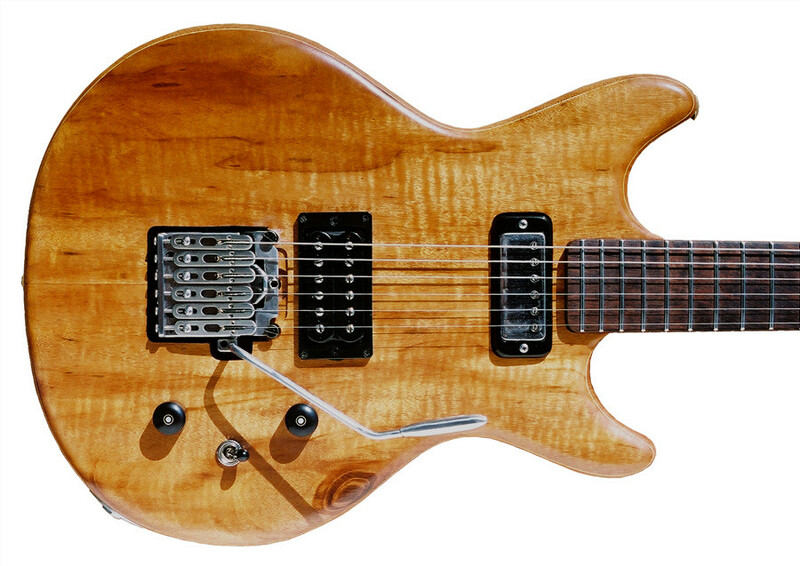 This one has a Lollar minihumbucker in the neck position, for a clearer, more transparent tone. Korina Neck and Body. Rosewood fingerboard, 25 ½" scale. 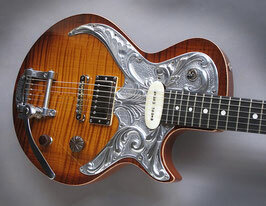 Aluminum casting from a second run done in Austria. 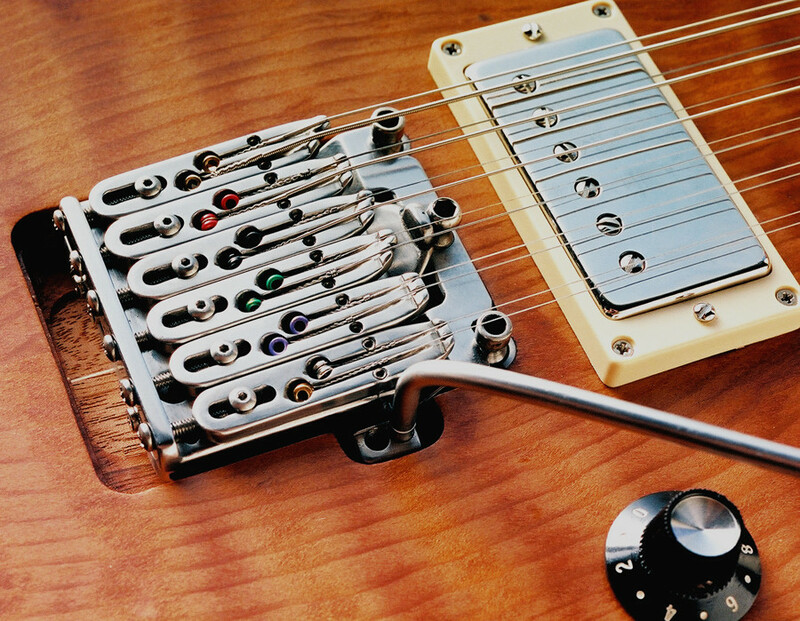 Gotoh vintage style tuners, ABR bridge, Bigsby B5, SD 59/JB humbucker combination. 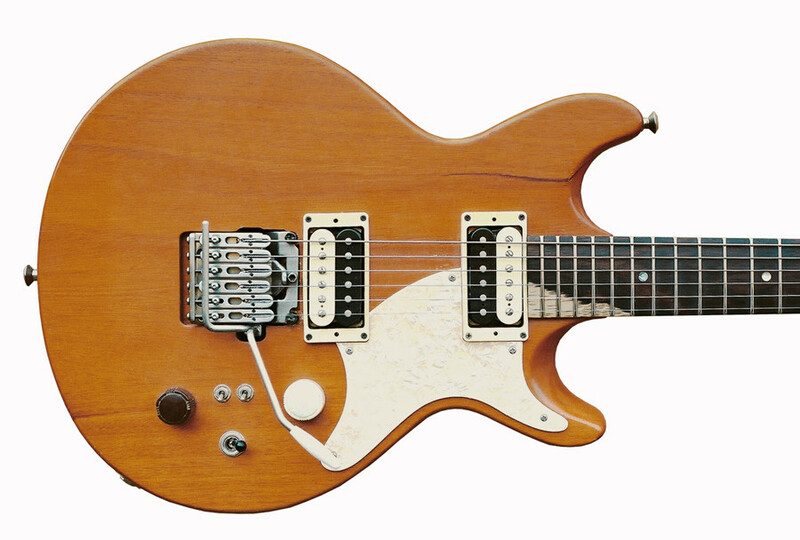 Vol, tone, 3-way switch. Dunlop Straplocks. 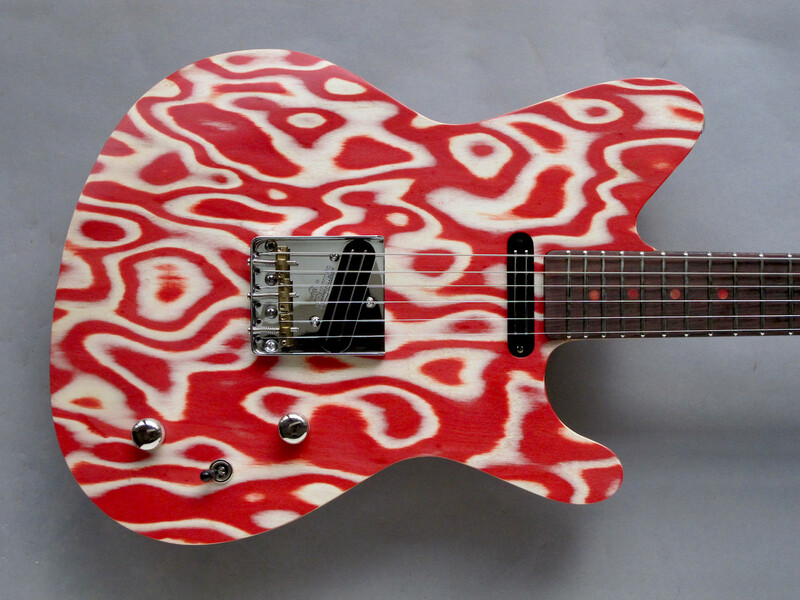 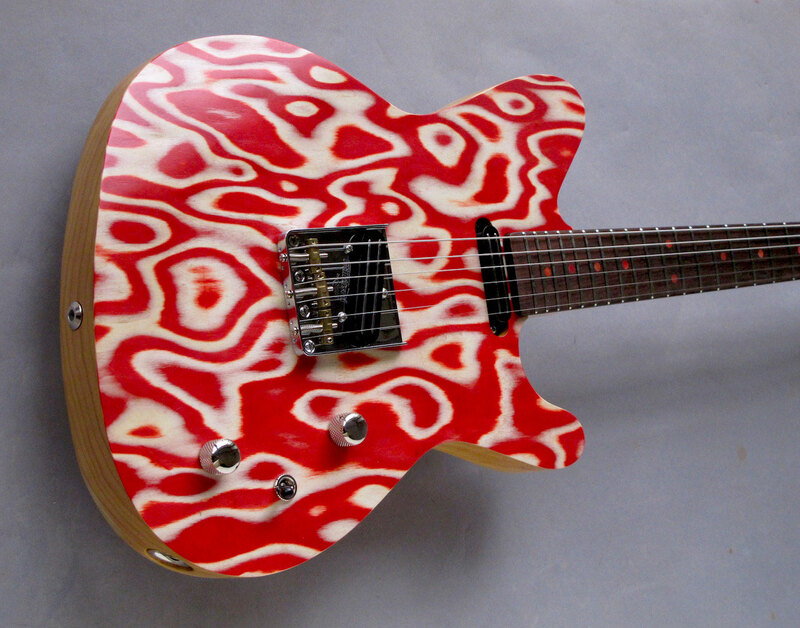 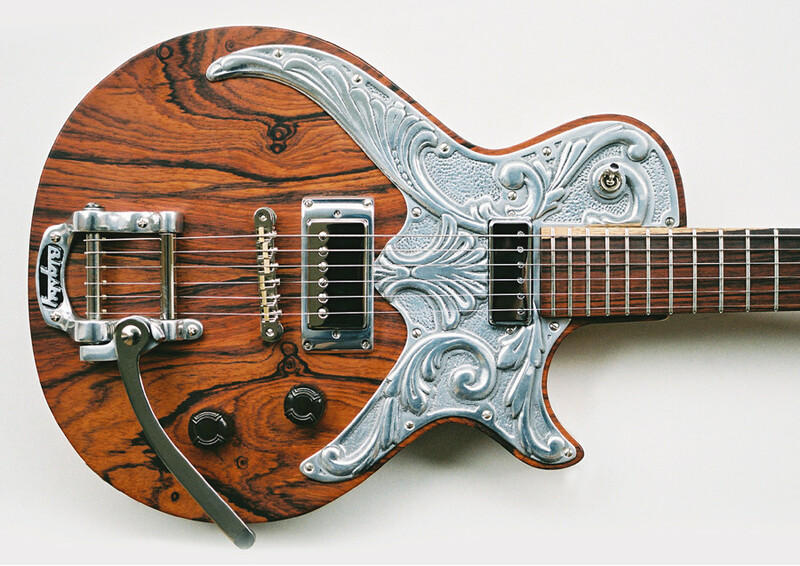 This guitar was originally designed for my friend Tommy Aguilar, a talented amp builder (Apache Amps). 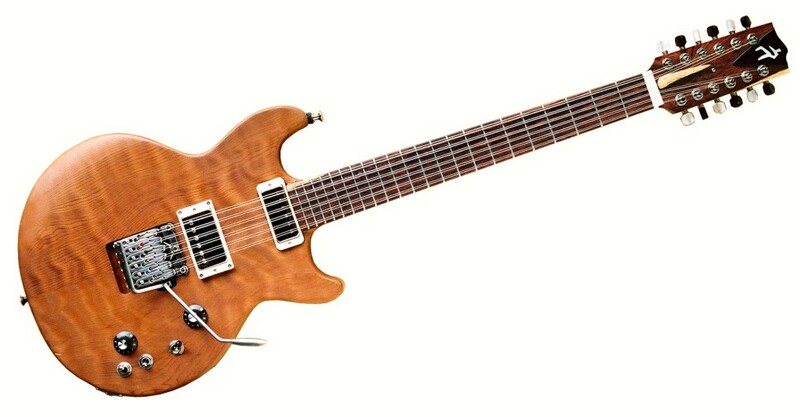 It has a 27" scale Rosewood neck with flame Rosewood fingerboard, and chambered Mahogany body with a figured Goncalo top. 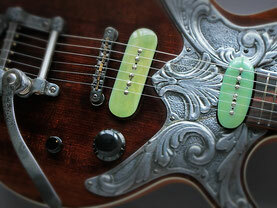 The neck and bridge pickups were originally vintage Gibson pickups, but I later replaced them with Lollars. 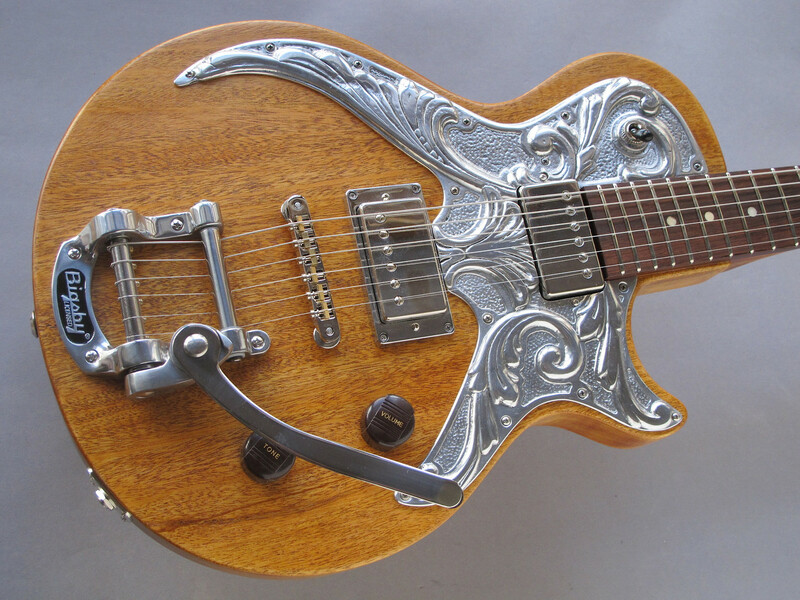 The tremolo on this guitar is a Don Ramsay 'Linear tremolo'. It is an amazing unit, jewel-like, running on precision linear bearings, without friction or wobble. 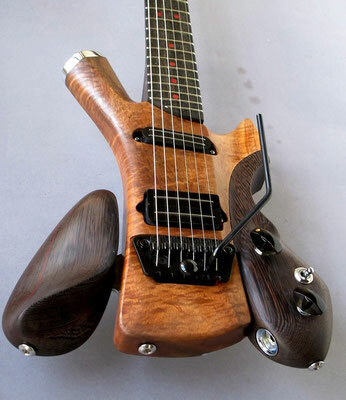 Due to the design, its range is also adjustable, from light warble to dive. 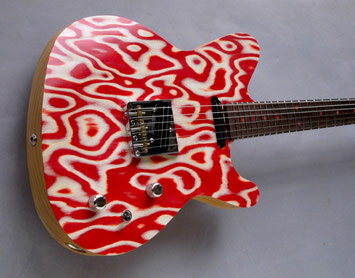 Strung with 11's and tuned to D this guitar sounds rich and throaty. 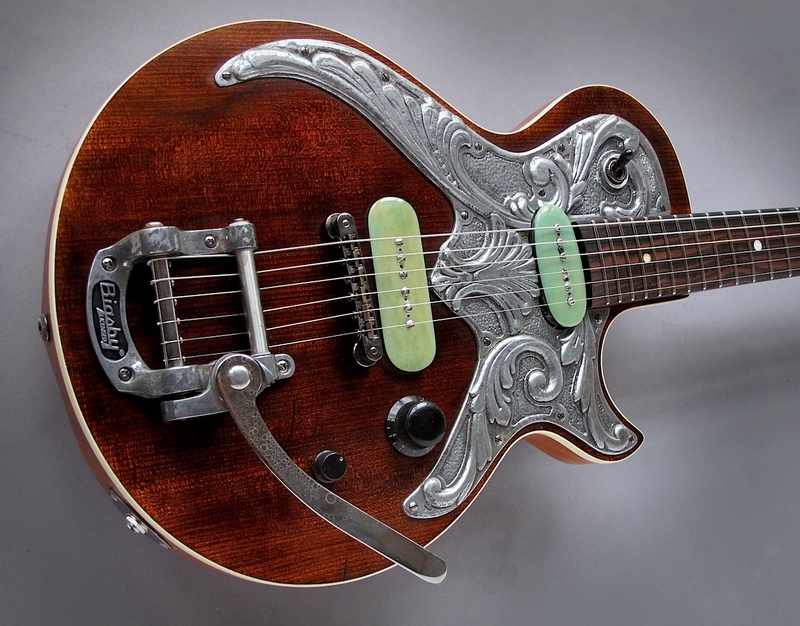 It is now part of Henry Kaiser's collection. 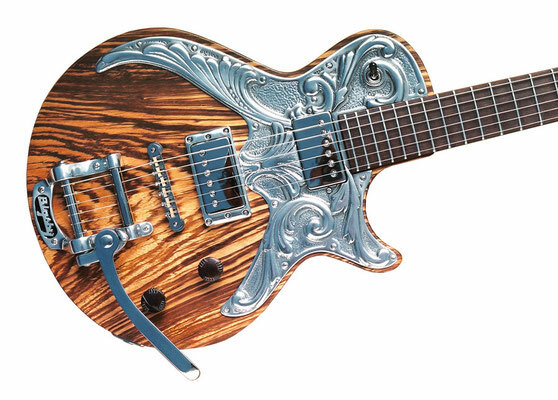 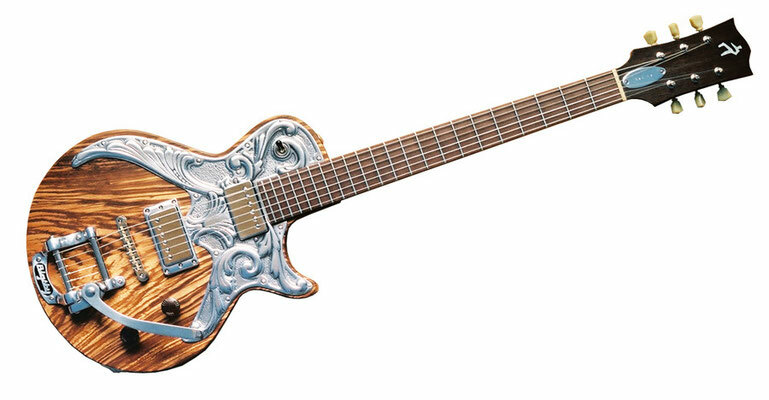 After using the original Totemguitar G 0404 'Puzzle' for some time, John Cale asked me to make something closer to the old Les Paul Special he loved so much. 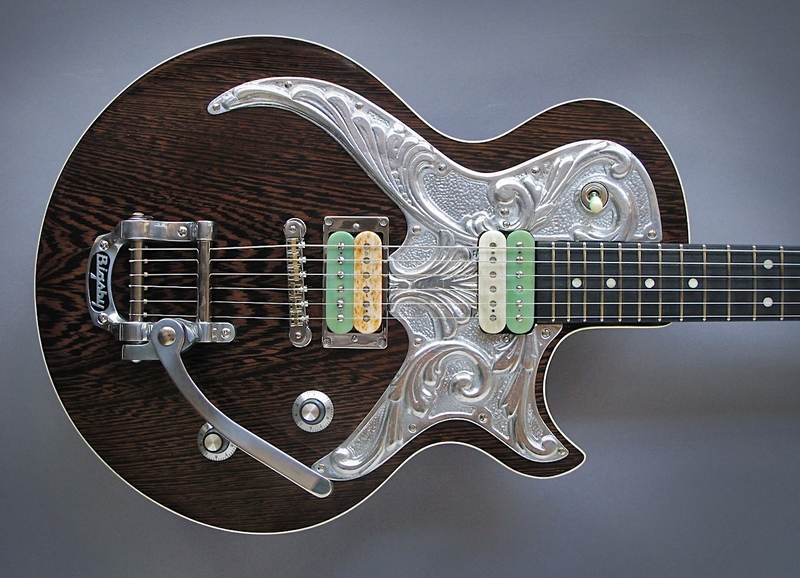 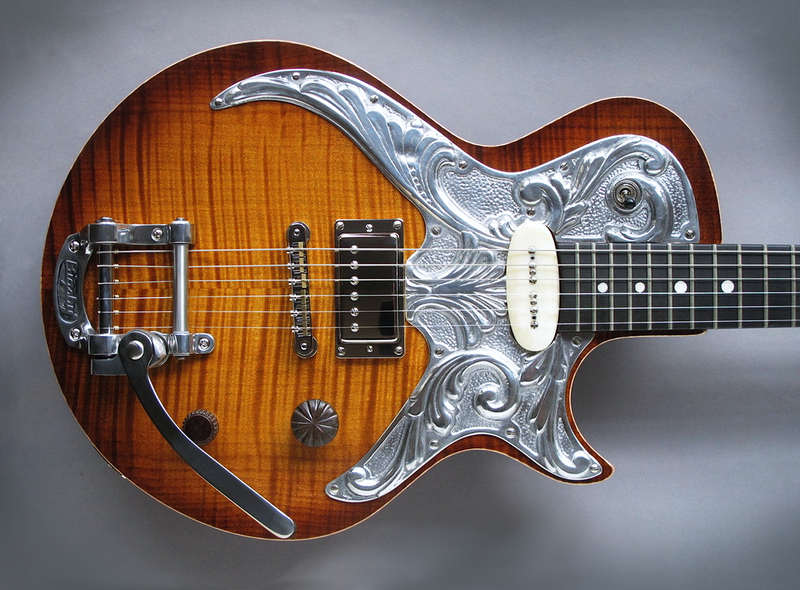 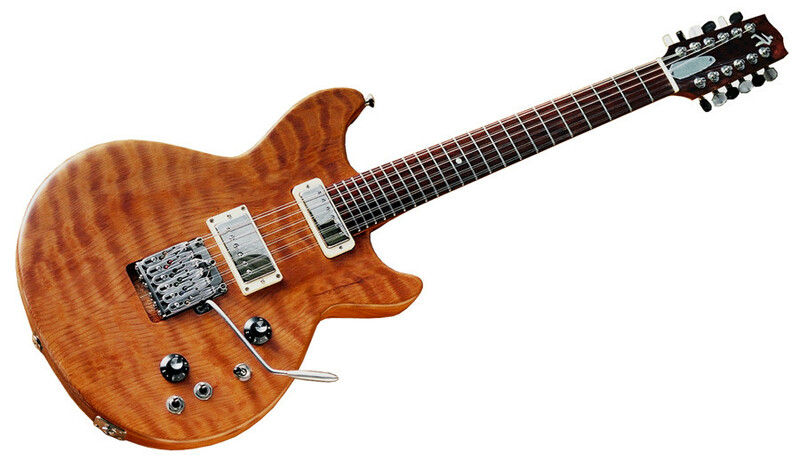 This guitar has an all-Mahogany set-neck construction with two humbuckers and a Bigsby bridge. 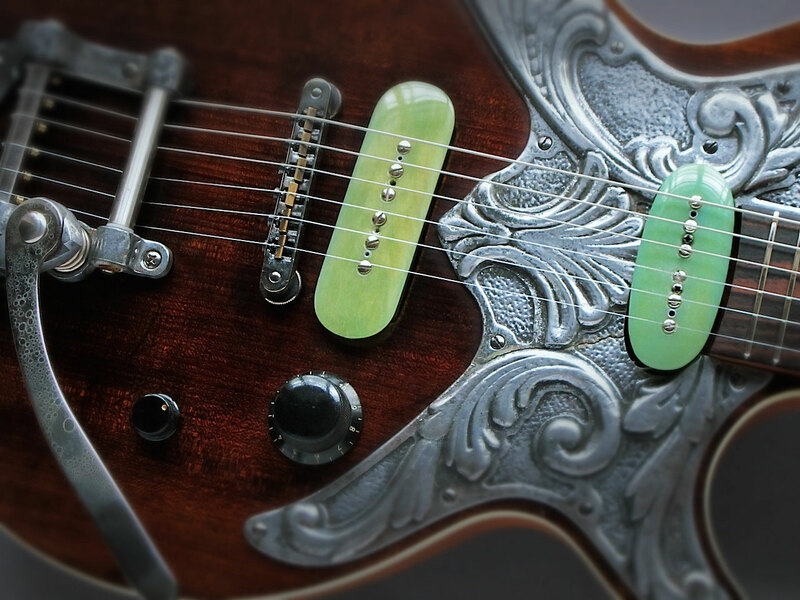 The humbuckers can be split individually via push-pull switches on the volume and tone knobs, giving a wide range of sounds. 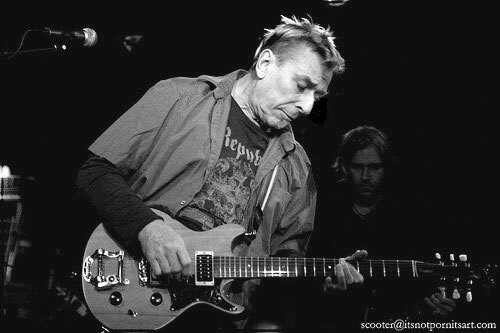 John Cale had seen a Don Ramsay 'linear tremolo' at my shop and was intrigued by it. 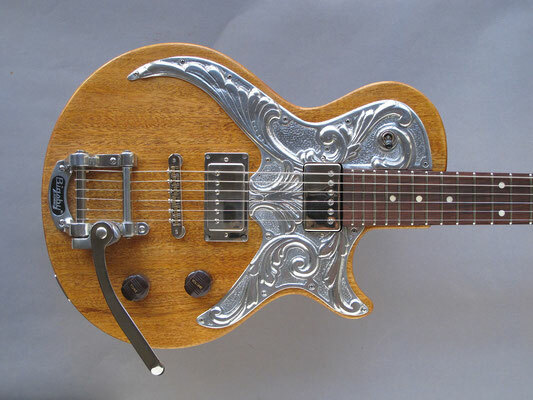 He asked me to make a guitar for him along the lines of the last one, but with a linear tremolo instead of the Bigsby. 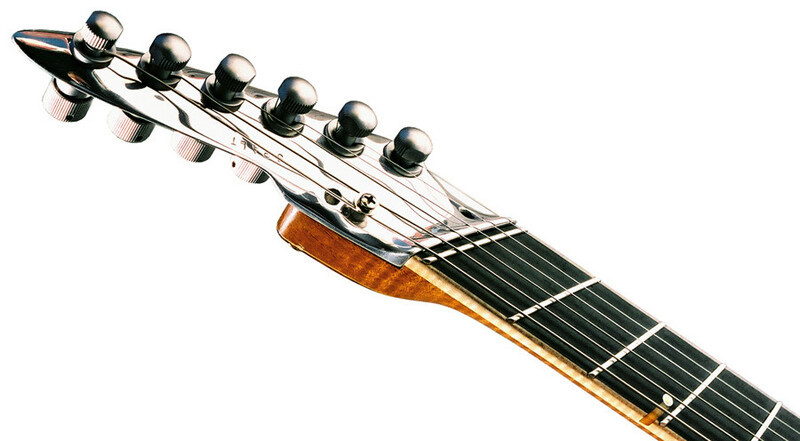 The linear tremolo combines smooth, adjustable action with extreme tuning stability. I also moved the pickup switching to two switches on the top, foregoing the push-pull type, which had proven cumbersome on the road. 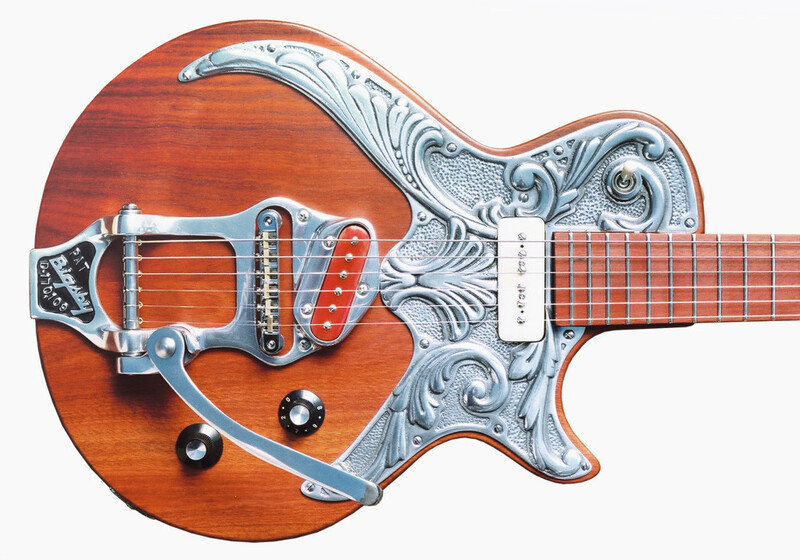 Happy with his 'linear tremolo' guitar, John Cale expressed his desire for a 12-string with tremolo. This created some technical issues (tuning stability, intonation). 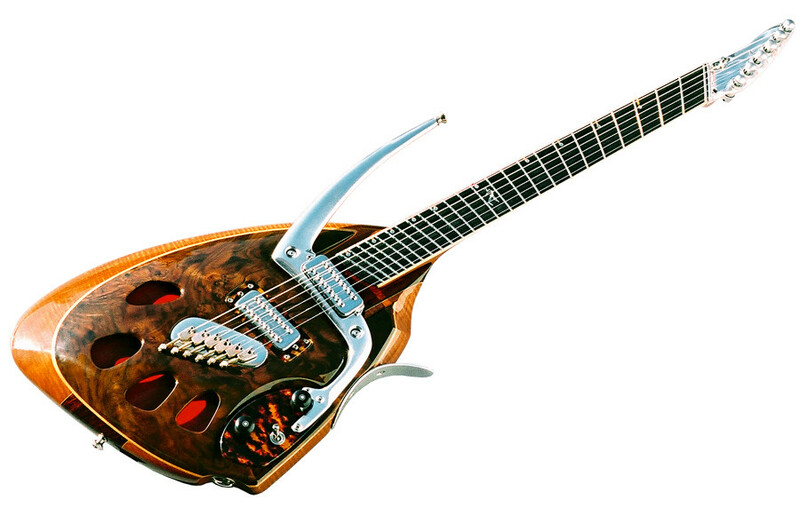 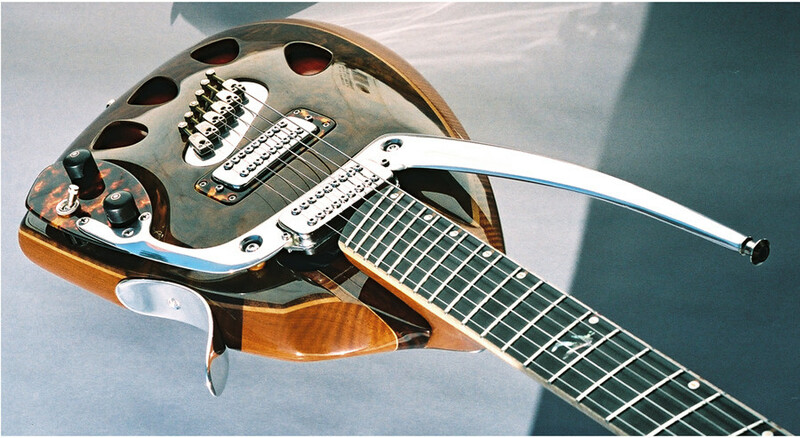 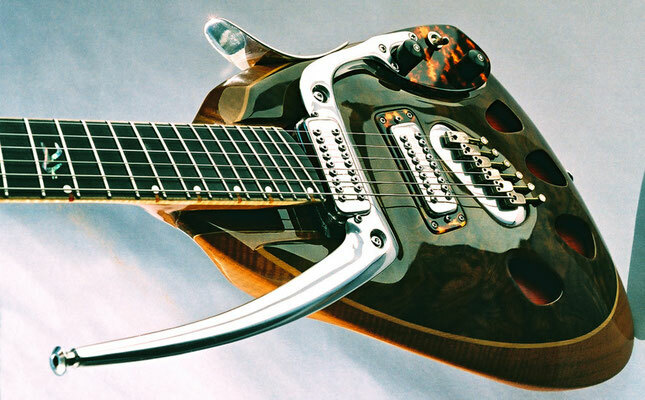 Working with Don Ramsay we adapted his 'linear tremolo' design for 12-strings. 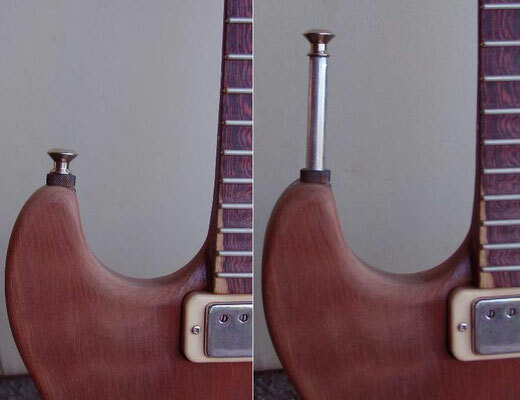 I extended the neck block all the way to the bridge, gluing it from the back into the flame Redwood body, to optimize coupling. 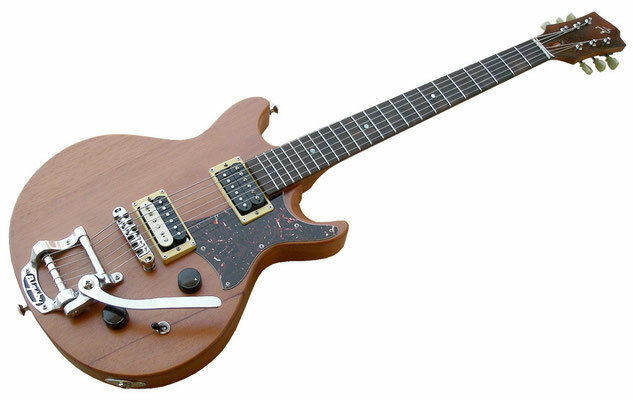 The guitar worked well, but proved too neck-heavy, due to the long neck, 12 tuners and very light body. 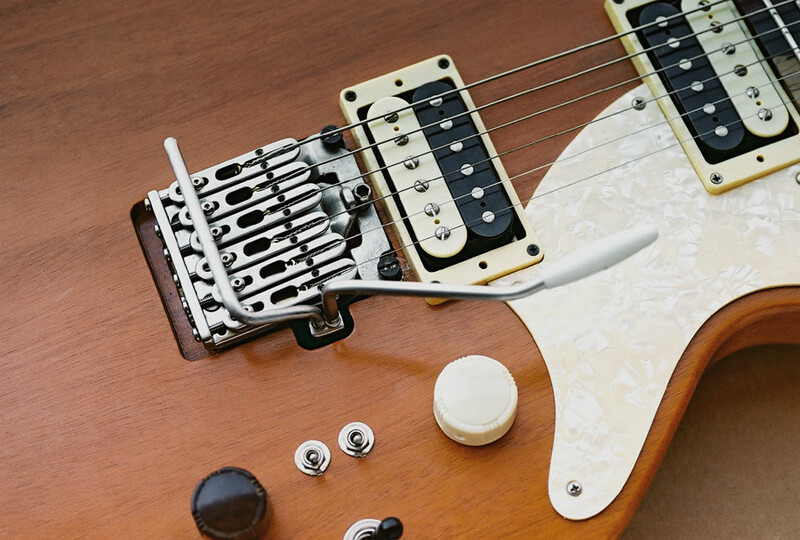 I installed a strap-button extension which helped. 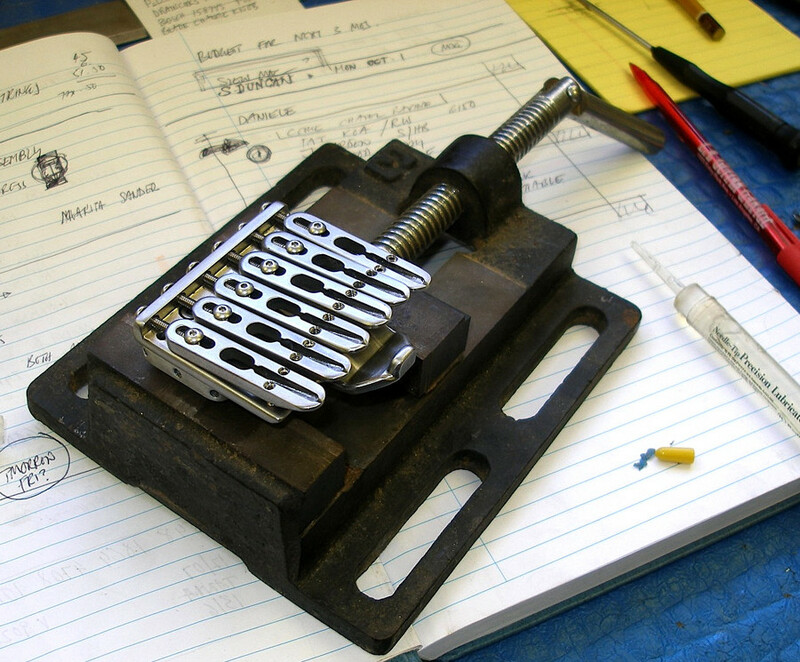 We liked it well enough, but decided it needed some improvements, so I went back to the design table. 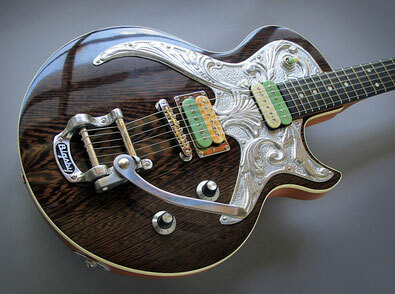 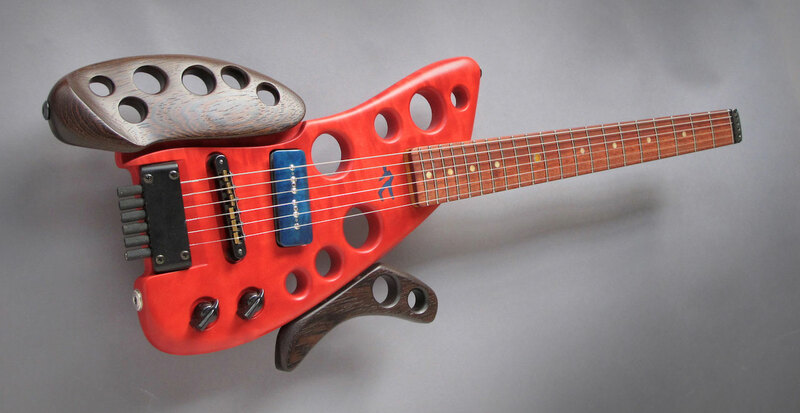 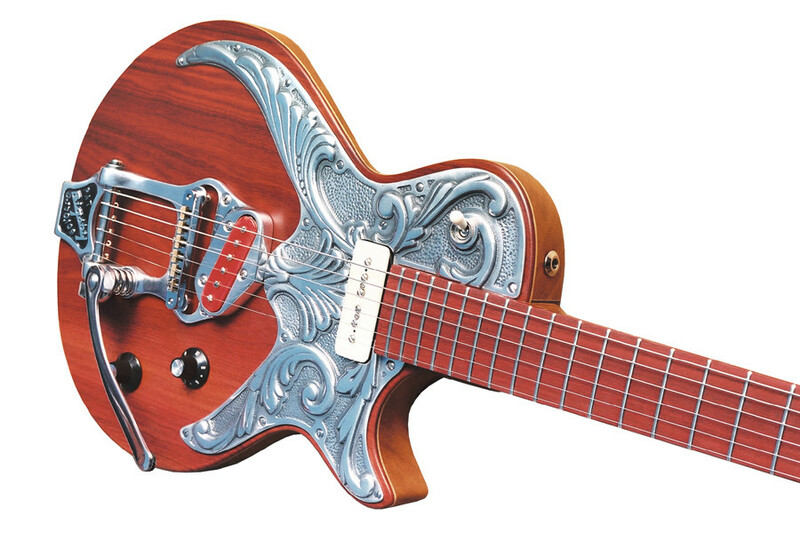 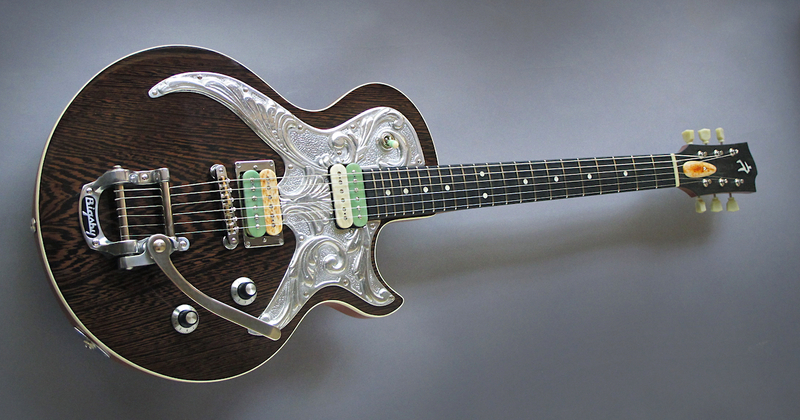 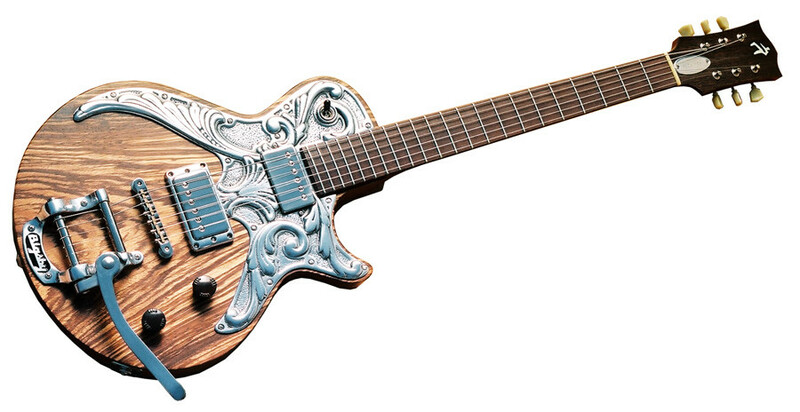 This is the final version of the "John Cale" 12-string. The neck is set slightly deeper into the body, with the horn extending further for better balance. 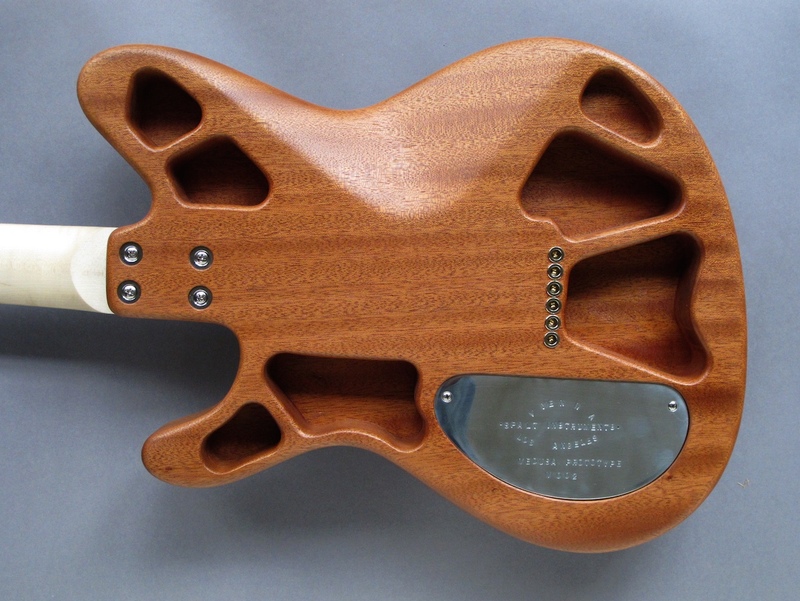 The body is carved out with chambers and a trough for the neck block which extends all the way to the tremolo posts, anchoring the trem there. 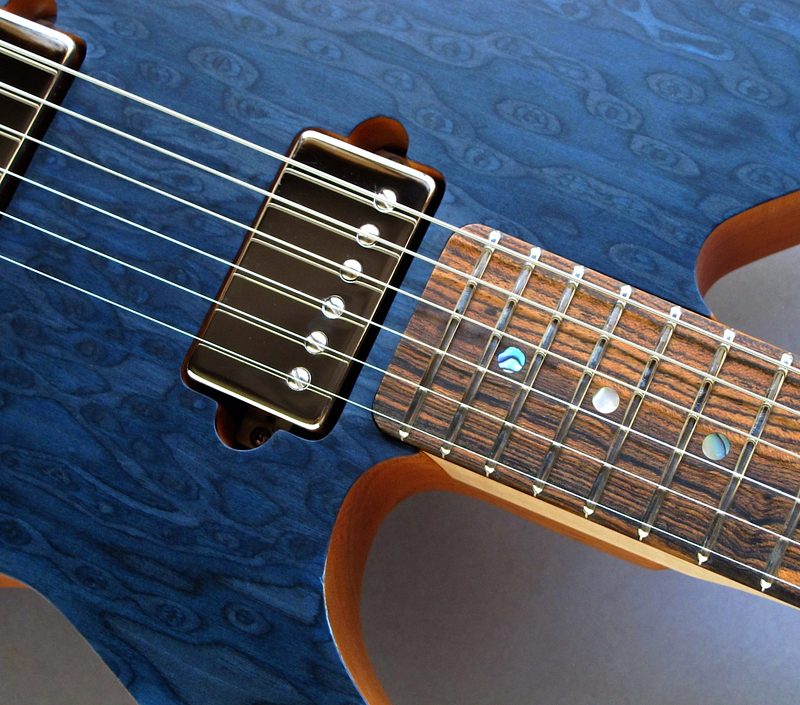 The Top is flame Redwood, light and resonant. 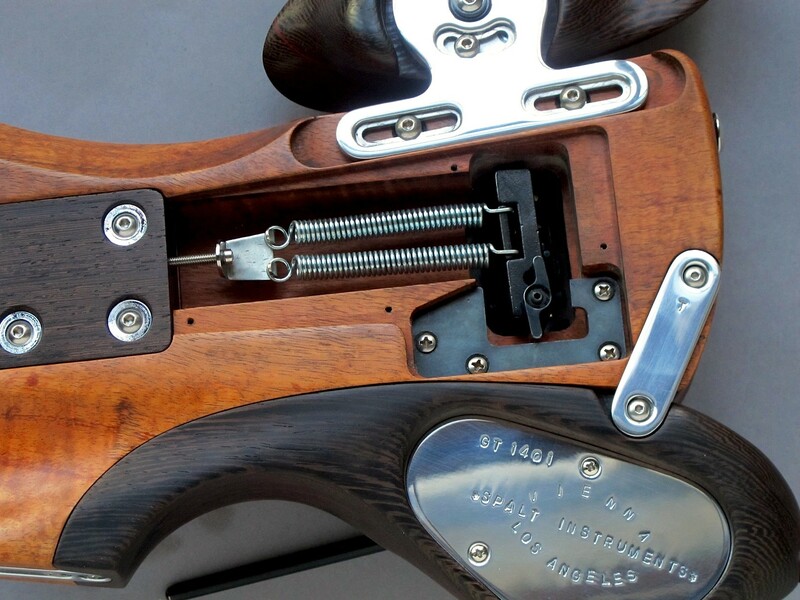 Since the body is still relatively light, I used Sperzel Open Back tuners to help improve the balance. 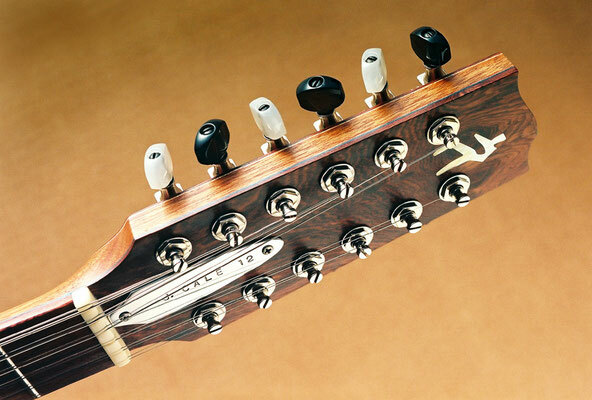 The tuner knobs alternate (black pearl for low strings, white pearl for high strings), to help orientation when tuning. The guitar has a rich chimey sound - a Lollar minihumbucker in the neck position and Imperial full-size humbucker in the bridge, along with bridge humbucker-split and phase switch allow for a lot of tonal variation. 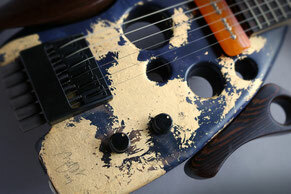 For images of the construction process click here.